My Pulse Is an Earthquake will be performed on stage by The New Short Fiction Series in Hollywood, an event sponsored by Barnes & Noble. Born in suburban Detroit, Kristin FitzPatrick grew up surrounded by music and books. She fell in love with old movies, photography, endurance running, and poetry before she started writing seriously. Her inspiration has come from music and from the people she met while working as a stagehand, nanny, waitress, editorial assistant, and English conversation teacher.Kristin earned degrees from Michigan State, DePaul University in Chicago, and Cal State Fresno, where she began writing and publishing some of the stories in this collection.A semifinalist for the 2014 Mary McCarthy Prize in Short Fiction, Kristin is the recipient of residencies from Jentel and The Seven Hills School in Cincinnati, where she held a creative writing teaching fellowship. Her work has been chosen for the Thomas Wolfe Fiction Prize and has appeared in publications such as "Colorado Review," "The Southeast Review," "Epiphany," and "The Best of Gival Press Short Stories," as well as on stage in Sacramento and Los Angeles.Kristin and her husband live in Southern California, among stacks of vinyl records and books. She s working on a novel and teaching writing to students whose stories inspire her to wake early, turn the volume up, and listen for more. 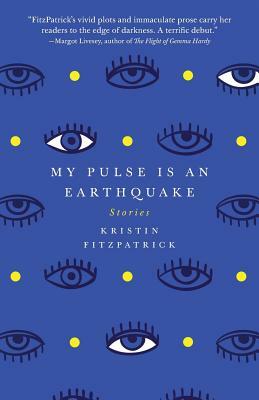 "My Pulse is an Earthquake" is her first book. Learn more atwww.kristinfitzpatrick.com."